For curious kids who want to think, discover, and make things together! July 6-31 for ages 5-7 and 8-12. Join us this summer as we explore other worlds through the looking glass, map the artistic adventures of walking, tinker with simple machines, and artfully construct tunnels and bridges. Contemporary art in deCordova's 30-acre Sculpture Park and Museum galleries connects the hive’s weekly themes to real world ideas, unbounded creativity, and inspiring innovation. Our instructors are artists, naturalists, and makers who love exploring and sharing the intersections between art and nature in a collaborative environment. Each camper’s personal interests and unique abilities are welcomed and complement those of new friends. At the hive everyone learns from each other. This camp must comply with regulations of the Massachusetts Department of Public Health and is licensed by the local board of health. 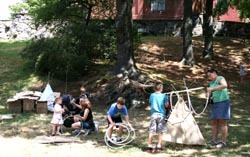 For more information about the hive and to register, visit decordova.org/camp, or contact Sarah Brockway at [email protected] or 781.259.3604. Members can reserve a week-long space for $470; not-yet-members can reserve a week-long space for $545. Some financial assistance is available; please inquire. Directions From the Fitchburg/South Acton Line of the MBTA Commuter Rail station, walk north on Lincoln Road 1.5 miles and turn left at Sandy Pond Road. DeCordova is located a half mile down the road on the right. For more details on how to get to deCordova, visit our Directions page.